The unicellular green alga Chlamydomonas reinhardtii has two flagella and a primitive visual system, the eyespot apparatus, which allows the cell to phototax. About 40 years ago, it was shown that the circadian clock controls its phototactic movement. Since then, several circadian rhythms such as chemotaxis, cell division, UV sensitivity, adherence to glass, or starch metabolism have been characterized. The availability of its entire genome sequence along with homology studies and the analysis of several sub-proteomes render C. reinhardtii as an excellent eukaryotic model organism to study its circadian clock at different levels of organization. Previous studies point to several potential photoreceptors that may be involved in forwarding light information to entrain its clock. However, experimental data are still missing toward this end. In the past years, several components have been functionally characterized that are likely to be part of the oscillatory machinery of C. reinhardtii since alterations in their expression levels or insertional mutagenesis of the genes resulted in defects in phase, period, or amplitude of at least two independent measured rhythms. These include several RHYTHM OF CHLOROPLAST (ROC) proteins, a CONSTANS protein (CrCO) that is involved in parallel in photoperiodic control, as well as the two subunits of the circadian RNA-binding protein CHLAMY1. The latter is also tightly connected to circadian output processes. 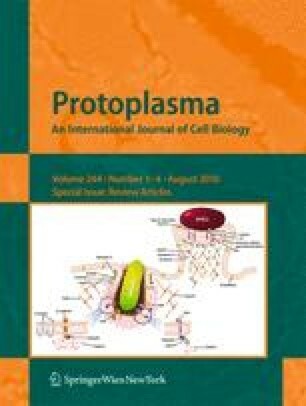 Several candidates including a significant number of ROCs, CrCO, and CASEIN KINASE1 whose alterations of expression affect the circadian clock have in parallel severe effects on the release of daughter cells, flagellar formation, and/or movement, indicating that these processes are interconnected in C. reinhardtii. The challenging task for the future will be to get insights into the clock network and to find out how the clock-related factors are functionally connected. In this respect, system biology approaches will certainly contribute in the future to improve our understanding of the C. reinhardtii clock machinery. Thomas Schulze and Katja Prager contributed equally. We thank Georg Kreimer, Takuya Matsuo, Stefanie Seitz, Federico Valverde, and Olga Voytsekh for helpful comments on the manuscript. Our work was supported by the Deutsche Forschungsgemeinschaft (grant no. Mi 373 to MM) and the BMBF (Project GoFORSYS, grant no. 0315260A, work package 1 to MM). TS has a fellowship in the Jena School for Microbial Communication that is supported by DFG.